OK, we have now past the target date, June 4. It is now officially really 76 years after the Battle Of Midway. Well not to worry, I'll just keep going. There's two reasons why I missed the target. 1. I had two stow away my hobby stuff for several months due to a move. 2. 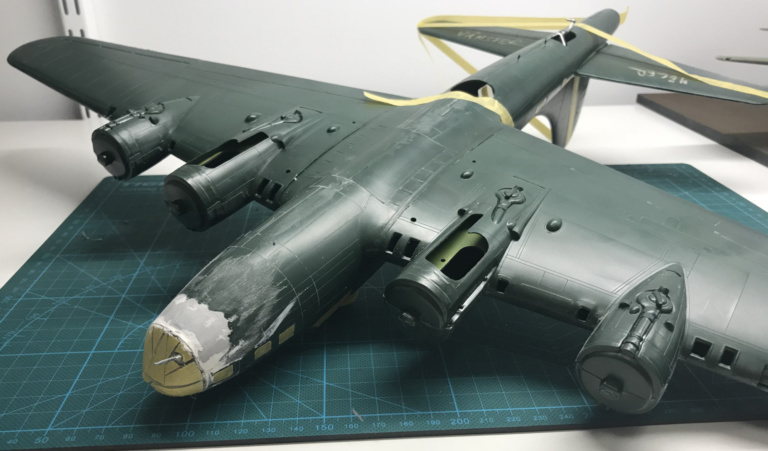 I started with ten kits to build but the more I read about the battle and the more I searched the internet for available kits the more I found (see previous blog posts). I think I can safely say that the tally will stop at sixteen kits. I'm still working at my B-17F to B-17E conversion. It's been fighting me all the way. To start with the kit as such is getting very old and by today's standard it leaves a lot to wish for. Then I had a hard time to find a conversion kit. And when I finally manage to lay my hands on one it turns out that the nose dome was the only part that I needed. A well needed Bendix turret for was not included. A spare Bendix tower from a B-25B kit was of no help either. I ended up by doing one in wood. Not the best result but still. Then the nose dome turned out not to be a perfect fit to the kit either so some filler work had to be done. The next challenge was trying to get the colours right. There's no records of exactly what colours they used when they improvised new camouflage at Hawaii. I used the colour documentary John Ford did on Midway and did the best I could. My next challenge will be the Nakajima E8N1 Dave. The kit as such looks good but it is a double decker and I always dread those. A lot of wiring and stuff. Another thing with this kit is that there are no reference pictures of the Dave from the cruiser Haruna that partook in the recognizance mission at Midway. No real hints on colouring and markings. Scavenging the internet I finally found a digital art portraying the actual plane. No chance of determining if the artist have taken any artistic licenses when doing it but it's as close as I can get. The Judy is still in the mail with estimated delivery some time before June 25th. It's travelling from Japan so it has a bit longer to travel than the Dave had. Then it's only to finish the SBD-3 and I'm done.